Why Use Requirements Management Software? As you can see from the quotes above, poor requirements management is a leading cause of software project delays (and even failures). And a good requirements software can help your team achieve project success – and build more successful products, more efficiently. Check out our blog post Requirements Management Tools Overview for a detailed overview of how you can benefit from requirements tools. Avoid project delays and failures caused by using general-purpose tools like Word, Excel, or issue trackers to manage your requirements. Build a systematic requirements management process with cloud-based (SaaS) requirements management software from Accompa and its purpose-built features for managing requirements that help product management, business analysis, engineering, and IT teams at 100s of companies (from Fortune 500s to growing startups). Discover the powerful features you get from Accompa’s requirements software, the 4 key benefits you can enjoy, the reasons why you should choose Accompa, and how companies get 17x ROI from Accompa. Manage requirements in a secure, central repository over the cloud. Access securely from any computer. Create structured requirements to track requirements attributes that are unique to your organization. 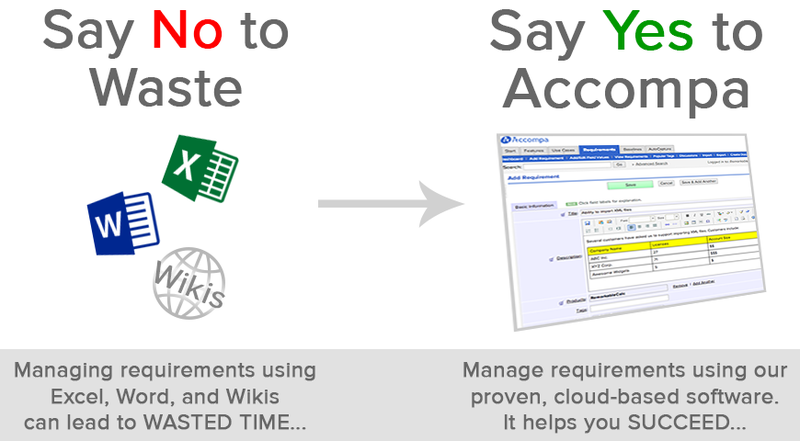 Manage requirements, features & use cases in an efficient fashion, eliminating the hassles of general-purpose tools (such as Word, Excel, issue trackers, and wikis). Track changes & dependencies automatically – and avoid missed requirements which often lead to project delays and failures. Automate requirements gathering via custom web forms & email addresses. Gather feature requests from customers and internal teams such as Sales & Support. Share up-to-date requirements and collaborate using tools such as discussion threads – to avoid incomplete & inaccurate requirements. Prioritize requirements using systematic methodology – focus your resources on the highest value requirements. Create consistent requirements documents in just a few clicks using intuitive wizard. Accompa starts at just $199/month. No installation or maintenance is required – as it’s a web-based requirements software delivered using cloud/SaaS model. Click here for your 30-day FREE Trial – you can get started in less than 5 minutes.